All holes are Par 3. 2. Pipe Dream - the tee is on the small rise, back and to the left of the 1st basket. Throw clear across the open area to the basket in the lee of the small bush line. Watch out for the road on your left if the wind is up! 3. Adventure's Nemesis - walk around the corner of the small bush line from the 2nd basket. The tee is between the two pillars that aim across the road and between the small channel. The basket is through and to the right of the channel. Have a quick check to make sure there is no one in the area of the basket before throwing. 4. Harbour Hideaway - just to the left of the wooden platform you will find the 4th tee, aiming out over the area to the tree line. The basket is 3m into the tree line where it starts to open up a little. This basket is visible from the 3rd basket. 5. I Think I Can - this tee is located on the grass bank roughly between the 3rd tee and 4th basket. 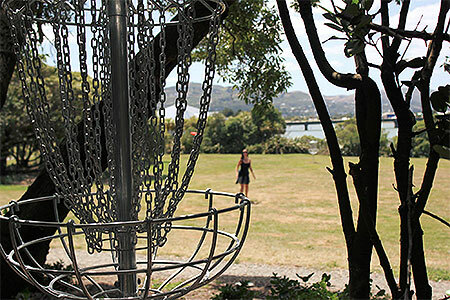 Aim over the road and all the way across the open area to the basket situated at the base of the tallest Pohutukawa tree opposite the tee. 6.Groove in the Groove - looking back towards the 5th tee, there is bench on the left side. The post near the bench is the 6th tee. The hole plays up to the basket placed in the small grove of trees. 7. 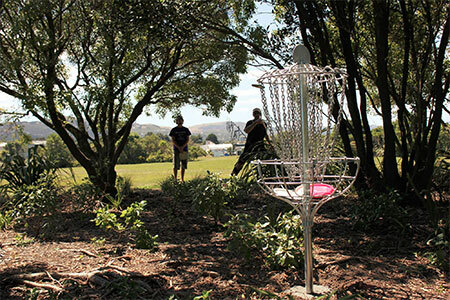 Dante's Inferno - from the small raised plateau with views of the Wellington skyline you play back down the park to the basket over and to the left of the small bush line behind the bench. 8. Beachfront Property - head left from the 7th basket and walk through the gap in the bushline, the 8th tee post is right in front of you. Play through the gap between the bush line and tree to the basket in the top left area near the bench. 9. Waste the Wood - tee from the wooden platform (or just in front of it if wet) aiming to the left of the 8th tee and continuing around the corner and down towards the tennis court and the final basket. Local Energy - Foreman Steve is enthused with labourer Iain Johnson's basket installation technique. 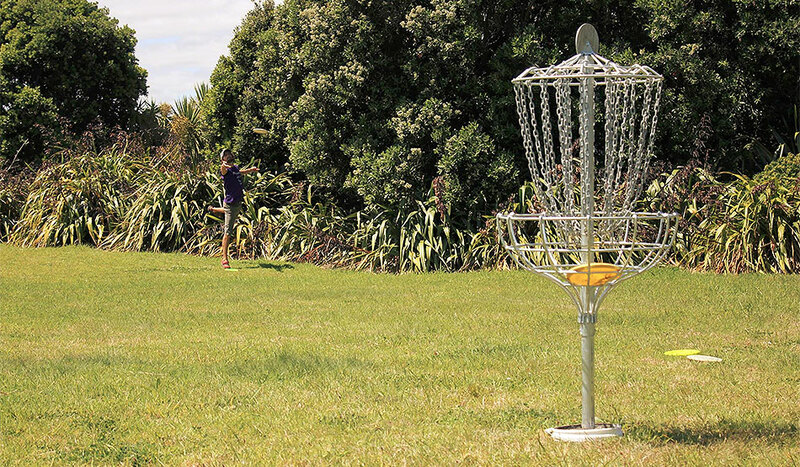 Sheltered Green - Some baskets are hiden in such a manner as to reward a well placed drive..
Nice Curves - The course features the newest Simon Feasey basket design, the same as Auckland's latest course at Waitawa Regional Reserve. Disc catching magic. Green and Bunkers - You will enjoy the challenges at Hikoikoi, especially when a wind is blowing up the valley (pic: Brian Oneil). Waterside Tee - Local golfer Sky HIghway drives with conviction. Drive down Marine Parade, past the Touch field of McEwan Park. The car park and first tee are on the right immediately after the blue-fenced tennis courts. 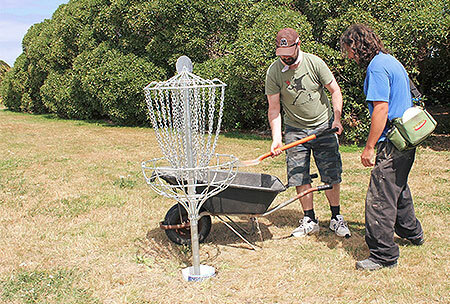 Course Description: 9 basket holes in a small, quiet park. Forgiving fairways make for a great beginners course with some well thought out tee and basket placements to keep the course interesting. The front 9 is marked and open to the public. Grab a round with a local regular to learn the unmarked back 9.